My family loves various types of bread and I would estimate that we have some kind of bread product with 2 out of 3 meals a day. When it comes to bread, we are really trying hard to incorporate organic bread and/or gluten-free breads into our daily diet to help improve our dietary health. Recently I was sent 4 complimentary loves of bread to try out for all of you from Manna Organics. If you have never heard of this company or have never tried their delicious products, you are really missing out! The company sells sprouted breads, organic breads, gluten-free breads, sourdough breads and wheat-free breads. Definitely something for everyone who enjoys eating a great tasting bread. The first one that we tried out was the Manna Bread ~ Banana Walnut Hemp Bread and wow...this one was delicious! We had this one mostly at lunch or dinner time with a little bit of organic honey butter smothered on top. It has a wonderful banana taste to it that is not overly powering at all. Some banana breads have way too much banana in them which is a turn off for me. This bread is a great source of fiber and Omega-3. The second one that we tried out was the Carrot Raisin Bread which is high in fiber and yeast free. I took this one into my aunt's nursing home and shared it with her & her roommate. My aunt has always loved carrot bread and she wasn't disappointed with this one! It has a nice flavor to it...that is not heavy at all. The third one that we tried out was the Gluten Free Ancient Grains Bread which is vegan, soy-free, gluten-free and nut-free. This is a sprouted Quinoa bread with millet and flax. My mother who is a health nut immediately nabbed this bread from me. She is a big lover of multi-grain breads and this one was right up her alley. She enjoyed toasting it & having it with her morning breakfasts. 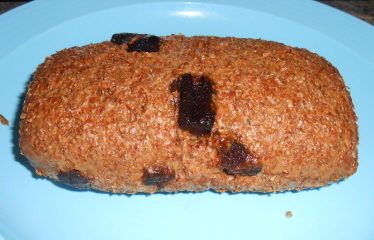 The final one that we tried out was the Sun Seed Bread which is high in fiber and yeast free. This is a sprouted organic whole wheat bread that we enjoyed with our nightly dinner with a little bit of honey butter on top. With this one...my hubby didn't care for the texture of the bread but my mother & I loved it. (He can be picky at times!). Overall...we are really impressed with the breads we tried from Manna Organics! I am going to buy a few loves of that Banana Walnut Hemp Bread and that Carrot Raisin Bread this week and take them into the nursing home for my aunt & her roommates to enjoy. While I am at it, I will pick up a few loaves for us too! I love the vegan kale chips which are made with organic, locally grown kale. I follow Manna Organics on Facebook. I follow Manna Organics on Twitter. I like Shelly on Facebook. I follow Shelly on Twitter @adianett. I am a public follower of the Shakin & Bakin Foodie Blog using Google Friend Connect as Maryann D.
Their carrot raisin bread looks amazing! i have tried their rye before and really liked it! would love to try and more sweet one. I follow Shelly on Pinterest. I entered the Gourmet Coffee from Coffee Bean Direct + Giveaway. I entered the TCC Old El Paso giveaway. I entered the TCC Barney giveaway. I entered the TCC Back to school giveaway. I entered the Coffee Bean Direct Giveaway. I love the.sourogh bavarian bread. Miami Dolphins NFL Beach Towel Giveaway. I entered the TCC Angelina Ballerina Giveaway. I entered the TCC Bazooka Candy Brands & Despicable Me 2 Candy giveaway. I entered the TCC The Marriage Merger by Jennifer Probst giveaway.